Episode: 26. Site Number: 016. Date Posted: 25 October 1996. Location: Svartskog, Norway. Type: Building. On the shores of Bundefjorden, about 19 km. 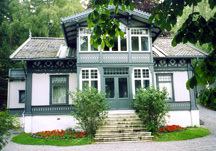 south of Oslo, is 'Uranienborg,' Roald Amundsen's house. There's a lot of gingerbread adorning the place, a gray and white color scheme, a tile roof and various decorative touches; even portholes in the great explorer's bedroom! It was at Uranienborg that Amundsen planned his polar expeditions; and it remains today as it was when he left in 1928 on that ill-fated attempt to rescue Umberto Nobile. The property was presented to the country in 1934 and is now a memorial museum. Included in the collections is Amundsen's polar library and various memorabilia, photographs, artwork and artifacts. Down near the shore of the fjord is a bronze statue of Amundsen, ski pole in hand, sled dog by his side. The address is: Roald Amundsens Hjem, R. Amundsensvei 192, N-1420 Svartskog; Tel +47 66 80 01 05. Open daily except Mondays from 11 to 4.